I love drawing dogs. It comes from a childhood without a dog and with a great yearning for a dog. If I had been a wise child, I would have asked for a small dog, a dog so small you could fit it into the palm of your hand, but no, I wanted the magnificent Irish wolfhound, the dog I read about in Finn the Wolfhound, or a massive German Shepard Dog to aid me in my spy work as I pretended to be Mrs. Emma Peel. No pleas to my father would work. He wisely said no. We lived in flats and who would walk the dog at night? I would! I would! But a ten-year old often promises the moon and delivers tears instead. 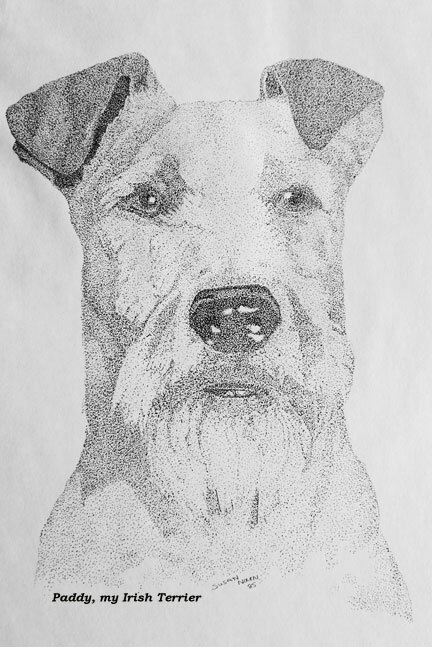 I have a dog now, Ted, a wire fox terrier. A sensible size. We don’t roam the Highlands of Scotland or walk the misty fields of Ireland. We walk city streets and if he needs to go out at night, well, I do walk him! 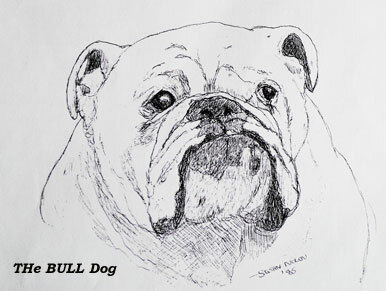 Here are just a few drawings of dogs, all drawn in India Ink, with an old-fashioned pen and inkwell. I love Pen and ink, there is such a wide variety of style and effects to choose from. In this Border Terrier study, the lines are heavy and bold. 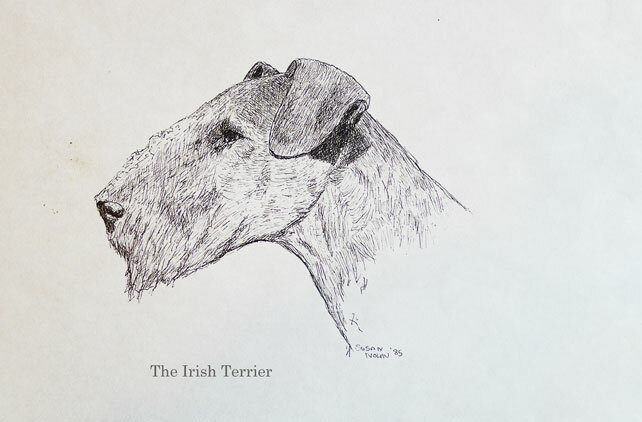 The Irish Terrier above is drawn with fine lines. A more delicate feel. 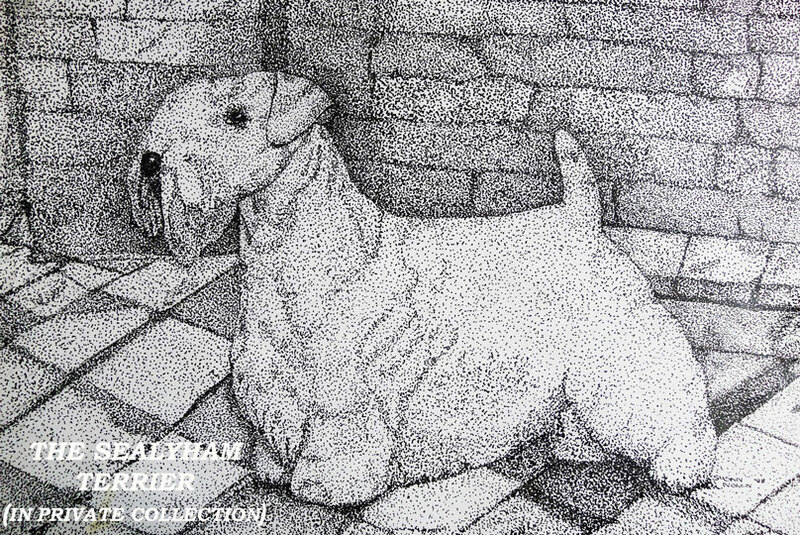 This study of the Sealyham Terrier was done in old-fashioned India Ink, a pen with a nib, one drop at a time. I went blind a few hours each time I work on it. The world became nothing more than dots. It took about seven nights to complete it. It was the last one I did in this style. 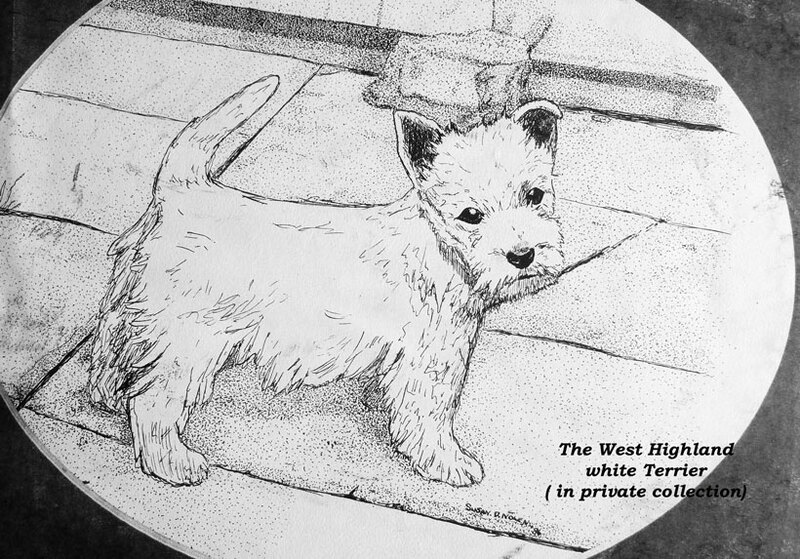 The Westie puppy. I was getting rather tired of seeing dots, so I decided to combine them, a few dots here, and lines elsewhere. This Bull Dog, Ch. Pugilist, just deserved the fine India Ink line. What a magnificent face he has! 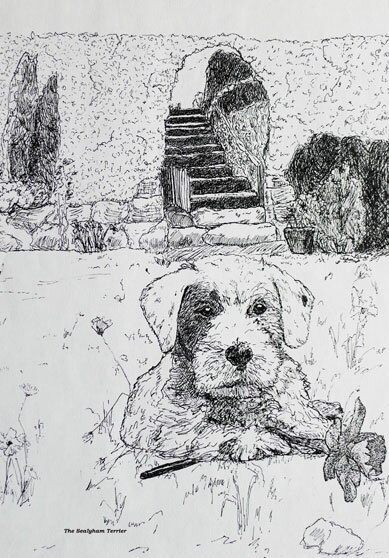 Gallery | This entry was posted in Art, Dogs and tagged A Dog so Small, Border Terrier, Bull Dog, Dogs, Emma Peel, Finn The Wolfhound, India ink, Irish Terrier, Irish Wolfhound, Pen and ink drawings, Sealyham Terrier, Terrier, Wire Fox Terrier. Bookmark the permalink. Hi Patricia, thanks for stopping by and making my day! 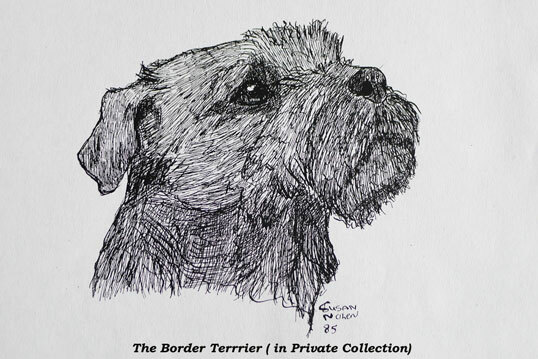 That Border Terrier Pen and Ink was sold and is in a private collection now. I can let you know when I do another Border! They are just amazing dogs. I still miss my Hadliegh and its been seven years since we lost him!